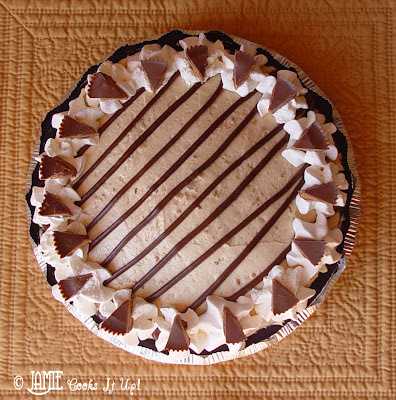 If you are a lover of peanut butter and chocolate….then this delectable pie is for you. We are indeed approaching the great pie making season of the year. This one is a piece of cake to make. Well, a piece of pie actually. Thanks to my sweet friend Trisha for having a birthday and being a lover of peanut butter and chocolate, so I could have a great excuse to give this recipe a try. I found it on a fellow food bloggers site. Laura, of Real Mom Kitchen has really given me a lot of advice about food blogging. I am indebted to her for her generosity in helping me understand things I had no idea about, just a mere two weeks ago. Her site is wonderful, she posts every day but Sunday. Check out her site, she’s got a lot of family friendly food and frequently has fun giveaways. On to the recipe! 1. Beat the peanut butter with the cream cheese until smooth. 3. Add in the 8 oz of Cool Whip and beat mixture until smooth, scraping the sides as needed. 4. Pour into the crust. 5. Melt the chocolate chips and Crisco in the microwave, cooking for only 30 seconds at a time and stirring between each heating interval. 6. Put the chocolate into a small Ziploc bag, cut a small hole in the corner of the bag. 7. 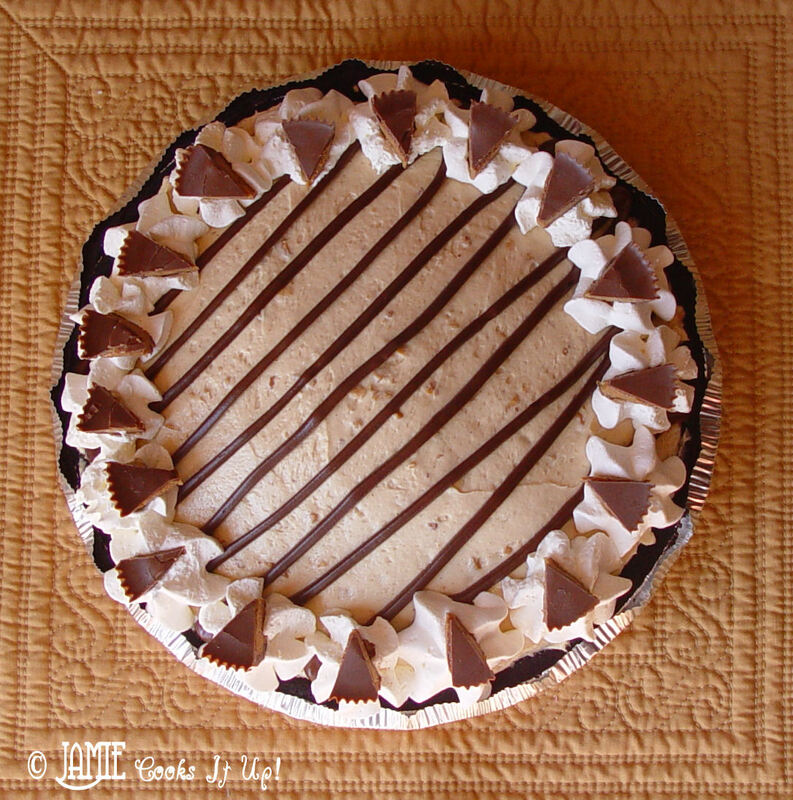 Pipe the chocolate in a decorative pattern on the top of the pie as desired. 8. Pipe the cool whip with a large star tip. 9. Cut the Reese's Peanut Butter Cups into 8ths and carefully place them on top of the decorative cool whip. 10. Refrigerate at least an hour before serving. Enjoy! Visiting from SITS. Enjoy the weekend. Over from SITS, great blog. I'm a follower now. I just checked out your profile-I should have said hi from another family of 7-we have 4 girls and one boy! i've made something similar to this but it wasn't as beautiful. It looks so delish!!!!!! I might just have to make this for my husband soon! Looks super easy and yummy. And I love Real Mom Kitchen too, she's got some great recipes! Inspired by this recipe to make my own! Very tasty! Not a big peanut butter fan but the story was touching! I'm reminded of the song by Garth Brooks….”If tomorrow never comes”. We never know what will be the last day so we should treat our precious loved ones with tender care. The last words I heard my husband say to me the morning he died were “I love you”. 18 years later they sustain me! Blessings to your dear friend and to you. Made this for my family last night, and it was a very very very rich tasting pie. A tiny piece is enough to be satisfied!